Nestled in the fjord-like Boka Bay a new superyacht marina, which is at the heart of the €650 million luxury development, is set to welcome superyachts next summer. Offering 238 berths, Portonovi marina will be able to accommodate yachts up to 70 metres year-round while yachts up to 120 metres can make use of its seasonal berths. An ideal starting or end point for exploring Montenegro and Croatia the marina will have a helipad and be an international port of entry. A member’s only yacht club, created by Winch Design, will be a focal point for visitors and there will also be a selection of high end shops and multiple restaurants in the marina village. Once completed Portonovi will also house 275 properties, including penthouse apartments and sky villas with infinity pools overlooking the marina. The first phase of properties will be ready for occupation by summer 2018. The complex will also be home to the first One&Only in Europe. The luxury hotel brand, that already has stunning offerings in other yachting hotspots including the Bahamas and the Maldives, will offer 140 rooms, villas, and residences and will be complemented by a vast Espace Chenot Health and Wellness Spa. Nestled in the fjord-like Boka Bay a new superyacht marina, which is at the heart of the €650 million luxury development, is set to welcome superyachts next summer. Offering 238 berths, Portonovi marina will be able to accommodate yachts up to 70 metres year-round while yachts up to 120 metres can make use of its seasonal berths. An ideal starting or end point for exploring Montenegro and Croatia the marina will have a helipad and be an international port of entry. A member’s only yacht club, created by Winch Design, will be a focal point for visitors and there will also be a selection of high end shops and multiple restaurants in the marina village. Once completed Portonovi will also house 275 properties, including penthouse apartments and sky villas with infinity pools overlooking the marina. The first phase of properties will be ready for occupation by summer 2018. The complex will also be home to the first One&Only in Europe. The luxury hotel brand, that already has stunning offerings in other yachting hotspots including the Bahamas and the Maldives, will offer 140 rooms, villas, and residences and will be complemented by a vast Espace Chenot Health and Wellness Spa. Perfect for anyone heading to the America's Cup Superyacht Regatta this June, the brand new Caroline Bay Marina sits in the Little Sound, Bermuda. The marina will be able to host yachts up to 90 metres and will have 30 berths for superyachts over 30 metres, as well as 80 berths for smaller vessels from six to 24.3 metres. Additionally, the marina will be hosting a variety of events throughout the 35th America's Cup in May and June on 47.7 metre charter yacht Arabella, including sunset cruises, rum tastings, day tours and themed suppers. . She will be situated on the America's Cup racecourse and available to marina guests who want to experience the race first hand. Once completed The Caroline Bay development, will feature a luxury Ritz-Carlton Reserve boutique hotel with, spa, restaurants and ultra high-end branded residences, which are due for completion by April 2018. The new complex offer a range of activities including watersports, hiking and cycling trails, access to golf across the street and a Ritz-Carlton kids' club. Perfect for anyone heading to the America's Cup Superyacht Regatta this June, the brand new Caroline Bay Marina sits in the Little Sound, Bermuda. The marina will be able to host yachts up to 90 metres and will have 30 berths for superyachts over 30 metres, as well as 80 berths for smaller vessels from six to 24.3 metres. Additionally, the marina will be hosting a variety of events throughout the 35th America's Cup in May and June on 47.7 metre charter yacht Arabella, including sunset cruises, rum tastings, day tours and themed suppers. . She will be situated on the America's Cup racecourse and available to marina guests who want to experience the race first hand. Once completed The Caroline Bay development, will feature a luxury Ritz-Carlton Reserve boutique hotel with, spa, restaurants and ultra high-end branded residences, which are due for completion by April 2018. The new complex offer a range of activities including watersports, hiking and cycling trails, access to golf across the street and a Ritz-Carlton kids' club. Golfito Marina Village and Resort, Costa Rica, was officially opened on March 1 after five years of development and can accommodate yachts up to 121 metres. Its first superyacht visitor was the 57 metre Halo. The marina is located within the gulf of Golfo Duce, making the marina immune from the swells of the Pacific Ocean. With a six-inch tidal range, a current that rarely exceeds 1.5 knots and winds that average five to seven knots, the marina offers a safe environment at all times. Though parts of the resort are still under construction, visitors to the marina will enjoy the benefits of a fully-equipped yard, 24/7 security and a huge range of yacht services. The hotly anticipated on-site yacht club is a members-only luxury, with restaurants, a cigar lounge, private concierge, fully-stocked bar and a spacious patio for evening drinks. The marina will also be offering a range of activities, from horse riding on the beach and canopy tours through the jungle to a range of watersports and yoga classes. Golfito Marina Village & Resort is also home to a luxury spa and swimming pool and is also close to luxury boutiques and fine dining restaurants. Additionally, a variety of luxury residences will be available, ranging from beachfront villas to a private island option. 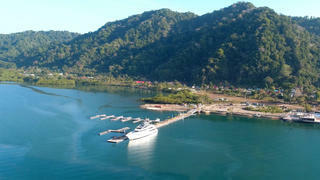 Golfito Marina Village and Resort, Costa Rica, was officially opened on March 1 after five years of development and can accommodate yachts up to 121 metres. Its first superyacht visitor was the 57 metre Halo. The marina is located within the gulf of Golfo Duce, making the marina immune from the swells of the Pacific Ocean. With a six-inch tidal range, a current that rarely exceeds 1.5 knots and winds that average five to seven knots, the marina offers a safe environment at all times. Though parts of the resort are still under construction, visitors to the marina will enjoy the benefits of a fully-equipped yard, 24/7 security and a huge range of yacht services. The hotly anticipated on-site yacht club is a members-only luxury, with restaurants, a cigar lounge, private concierge, fully-stocked bar and a spacious patio for evening drinks. The marina will also be offering a range of activities, from horse riding on the beach and canopy tours through the jungle to a range of watersports and yoga classes. Golfito Marina Village & Resort is also home to a luxury spa and swimming pool and is also close to luxury boutiques and fine dining restaurants. Additionally, a variety of luxury residences will be available, ranging from beachfront villas to a private island option. A marina in Ventimiglia, Italy, which is approximately 14.6 kilometres away from the Principality of Monaco by boat, is set to offer luxury yacht owners the opportunity to rent one of the planned 171 berths on a 40-year basis. The Cala del Forte will accommodate yachts ranging from 6.5 to 60 metres and the marina should be fully operational by summer 2018. By 2019, the marina will have a variety of shops, cafés, parking, shipyard, promenade and gardens and either an elevator or funicular to take visitors to the historical Ventimiglia Old Town. The marina has been bought by the SMIP (Société Monégasque Internationale Portuaire), an organisation owned by the Monaco Government, and will be fully integrated into the management of the Port of Monaco, which also operates Port Hercule and the Port of Fontvieille. 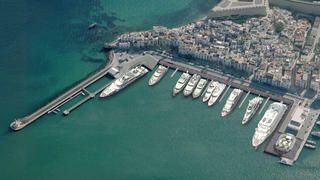 "The purchase of Cala del Forte was a unique opportunity to build a brand-new marina in the immediate surroundings of the Principality," Gianbattista Borea d'Olmo, director of Monaco Ports and Cala del Forte, told Boat International. "The benefits of this investment will include the development of a cross-border collaboration, the creation of new jobs, the demonstration of a new type of eco-responsible and ethical marina management as well as the expansion to the East of traditional yacht cruising grounds." The current waiting list for berths in Monaco goes into the hundreds and during summer months, more than 50 applications for berths are rejected per day. "The new development will strengthen the deep historical and cultural links between our communities by enriching the personal and economic relationships that Ventimiglia has with the Principality," Borea d'Olmo added. Aside from being a stone's throw away from the Principality, the port is within walking distance of one of the most famous food markets on the Italian coastline and provides one of the most sheltered harbours. The picturesque Old Town of Ventimiglia is also the perfect alternative for a day trip away from the hustle and bustle of Monaco. A marina in Ventimiglia, Italy, which is approximately 14.6 kilometres away from the Principality of Monaco by boat, is set to offer luxury yacht owners the opportunity to rent one of the planned 171 berths on a 40-year basis. The Cala del Forte will accommodate yachts ranging from 6.5 to 60 metres and the marina should be fully operational by summer 2018. By 2019, the marina will have a variety of shops, cafés, parking, shipyard, promenade and gardens and either an elevator or funicular to take visitors to the historical Ventimiglia Old Town. The marina has been bought by the SMIP (Société Monégasque Internationale Portuaire), an organisation owned by the Monaco Government, and will be fully integrated into the management of the Port of Monaco, which also operates Port Hercule and the Port of Fontvieille. "The purchase of Cala del Forte was a unique opportunity to build a brand-new marina in the immediate surroundings of the Principality," Gianbattista Borea d'Olmo, director of Monaco Ports and Cala del Forte, told Boat International. "The benefits of this investment will include the development of a cross-border collaboration, the creation of new jobs, the demonstration of a new type of eco-responsible and ethical marina management as well as the expansion to the East of traditional yacht cruising grounds." The current waiting list for berths in Monaco goes into the hundreds and during summer months, more than 50 applications for berths are rejected per day. "The new development will strengthen the deep historical and cultural links between our communities by enriching the personal and economic relationships that Ventimiglia has with the Principality," Borea d'Olmo added. Aside from being a stone's throw away from the Principality, the port is within walking distance of one of the most famous food markets on the Italian coastline and provides one of the most sheltered harbours. The picturesque Old Town of Ventimiglia is also the perfect alternative for a day trip away from the hustle and bustle of Monaco. A new superyacht marina is being developed in the Port of Ibiza Town after the Ports of Balearics APB granted a concession to YSM, the specialist marina division of Sovren House Group. The area covered includes the former Port Ibiza Town marina and Duques de Alba, as well as a new showcase facility called Es Martell on the dock at Darsena del Levante. This area previously had a maximum length of 40 metres but the new development will be able to cater for yachts measuring up to 185 metres. As a result, it is expected to attract an influx of ultra-high net worth individuals and provide a boost to the local economy. The new marina is due to launch in time for the 2017 Mediterranean season. Stephen White, founder and CEO of Sovren House Group, said: "We will be ground-breaking both in Ibiza and across the Balearics in providing the kind of marina that is worthy of the expanding fleet of superyachts." He added the Sovren House Group has already begun working with local authorities to ensure that the new marina brings positive benefits to the community. Often referred to as the jewel in the crown of the West Mediterranean, Ibiza Old Town is a popular destination for high profile visitors, from Hollywood stars to European royalty. A new superyacht marina is being developed in the Port of Ibiza Town after the Ports of Balearics APB granted a concession to YSM, the specialist marina division of Sovren House Group. The area covered includes the former Port Ibiza Town marina and Duques de Alba, as well as a new showcase facility called Es Martell on the dock at Darsena del Levante. This area previously had a maximum length of 40 metres but the new development will be able to cater for yachts measuring up to 185 metres. As a result, it is expected to attract an influx of ultra-high net worth individuals and provide a boost to the local economy. The new marina is due to launch in time for the 2017 Mediterranean season. Stephen White, founder and CEO of Sovren House Group, said: "We will be ground-breaking both in Ibiza and across the Balearics in providing the kind of marina that is worthy of the expanding fleet of superyachts." He added the Sovren House Group has already begun working with local authorities to ensure that the new marina brings positive benefits to the community. Often referred to as the jewel in the crown of the West Mediterranean, Ibiza Old Town is a popular destination for high profile visitors, from Hollywood stars to European royalty. 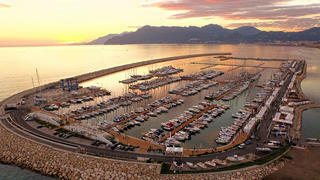 The finishing touches have been added to the new Marina d’Arechi in Salerno, Italy and the development is now open, with 1,000 berths including 80 specifically for superyachts up to 100 metres. Located at the heart of a UNESCO World Heritage site, the marina boasts 340,000 square metres of water basin dedicated to yachts with a scenic backdrop and an eco-friendly design. Marina d’Arechi is the creation of Agostino Gallozzi, chairman of Gallozzi Group, which has invested €120 million in the project — €80 million of which was concentrated on the marina infrastructure. “For anyone living in Salerno, sailing and yachting on the Amalfi Coast is the ideal way of enjoying weekends and holidays with friends and family throughout the year. From the age of 15 sailing the Mediterranean waters I visited so many marinas, none of which really satisfied me 100%," Agostino Gallozzi said. The new marina is now part of the Camper & Nicholsons Marinas' network. Dubai is hoping to become one of the world's leading superyacht hubs thanks to plans for a new marina, which will be the largest in the Middle East and North Africa. Plans were made public on January 2 for Dubai Harbour, which will feature 1,400 berths for vessels up to 85 metres. Located alongside world-renowned Palm Island, a 135 metre lighthouse will sit at the ocean end of Dubai Harbour and will offer 360 degree views from the observation deck as well as a luxury hotel. The 1,858,060 square metre development will also offer a cruise ship terminal, retail space, events arena, shopping mall, yacht club and a number of residences. The announcement was made by His Highness Shaikh Mohammed bin Rashid Al Maktoum, who said: “We are happy that this new project, which represents a unique and innovative new addition to the region’s tourism landscape, opens up a range of new opportunities to investors. Dubai Harbour creates a venue for new investments that support our vision for this important sector and promises to further accelerate the expansion of the tourism industry in the UAE, which is already growing rapidly.” The project looks to encourage tourism in the area and is inspired by the Gulf’s historical maritime links. In addition to the water stations, the marina will have two helipads so guests can visit by land, sea or air. “Our region has had a long and historic relationship with the sea, and today we are seeing another initiative inspired by this age-old tradition that opens up new horizons for development. We have great aspirations for the tourism sector, which is one of the main pillars of our economic development and an important source of national income,” he added. The development, which follows the ongoing construction of a new marina being built alongside the world's longest indoor ski slope in Dubai, is expected to take four years to finish once work starts and will expand Dubai’s yacht capacity by 50% on completion. Dubai is hoping to become one of the world's leading superyacht hubs thanks to plans for a new marina, which will be the largest in the Middle East and North Africa. 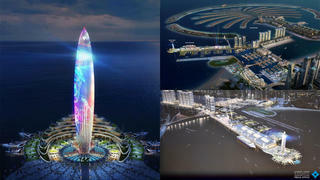 Plans were made public on January 2 for Dubai Harbour, which will feature 1,400 berths for vessels up to 85 metres. Located alongside world-renowned Palm Island, a 135 metre lighthouse will sit at the ocean end of Dubai Harbour and will offer 360 degree views from the observation deck as well as a luxury hotel. The 1,858,060 square metre development will also offer a cruise ship terminal, retail space, events arena, shopping mall, yacht club and a number of residences. 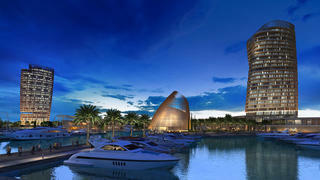 The project looks to encourage tourism in the area and is inspired by the Gulf’s historical maritime links. In addition to the water stations, the marina will have two helipads so guests can visit by land, sea or air. “Our region has had a long and historic relationship with the sea, and today we are seeing another initiative inspired by this age-old tradition that opens up new horizons for development. We have great aspirations for the tourism sector, which is one of the main pillars of our economic development and an important source of national income,” he added. The development, which follows the ongoing construction of a new marina being built alongside the world's longest indoor ski slope in Dubai, is expected to take four years to finish once work starts and will expand Dubai’s yacht capacity by 50% on completion. Work is underway on a new £190 million superyacht marina complex in Ayia Napa, Cyprus. The new 600 berth marina will be able to accommodate yachts up to 80 metres and is scheduled for completion in 2021. The development, which will also include 190 apartments and a series of villas, is the brainchild of Cypriot entrepreneur Gerasimos Caramondanis and Egyptian investor Naguib Sawiris. The marina has been specially designed to minimise breakwater to ensure a comfortable stay and will offer a wide range of marine services. 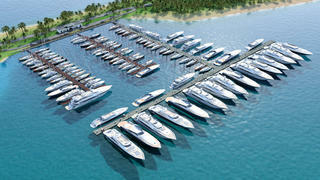 The marina will be home to a brand new yacht club and beach club as well as a dedicated crew lounge. The neighbouring Pyare Village will act as the commercial hub of the marina, offering shops, cafés, restaurants and on-shore activities along a waterfront pedestrian promenade. “Cyprus is a safe haven blessed by beautiful nature, year-round sunshine, modern infrastructure, a high standard of living and a genuine culture of warmth and hospitality, strategically located in the eastern Mediterranean at the crossroads of three continents – Europe, Asia and Africa,” said Ayia Napa Marina CEO, Stavros Caramondanis. “The modern, competitive and simple business environment coupled with a high quality of life make Cyprus an ideal place for both visitors and investors.” The main feature of the development is two towers measuring more than 100 metres in height, which will both offer panoramic views. A mix of one, two, three and four-bedroom apartments will be available, as well as two full-floor penthouse residences. “We’re not just building a place to live – we’re launching a new era in modern beachfront living,” said Project Partner Naguib Sawiris. “We will exceed the expectations of our residents and our guests and not only transform the Cyprus skyline, but change the way you think about Cyprus.” With completion expected within the next five years the development is expected to revolutionise the Cyprus superyacht stay. Work is underway on a new £190 million superyacht marina complex in Ayia Napa, Cyprus. The new 600 berth marina will be able to accommodate yachts up to 80 metres and is scheduled for completion in 2021. The development, which will also include 190 apartments and a series of villas, is the brainchild of Cypriot entrepreneur Gerasimos Caramondanis and Egyptian investor Naguib Sawiris. The marina has been specially designed to minimise breakwater to ensure a comfortable stay and will offer a wide range of marine services. 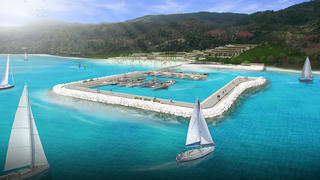 The marina will be home to a brand new yacht club and beach club as well as a dedicated crew lounge. The neighbouring Pyare Village will act as the commercial hub of the marina, offering shops, cafés, restaurants and on-shore activities along a waterfront pedestrian promenade. The main feature of the development is two towers measuring more than 100 metres in height, which will both offer panoramic views. A mix of one, two, three and four-bedroom apartments will be available, as well as two full-floor penthouse residences. With completion expected within the next five years the development is expected to revolutionise the Cyprus superyacht stay. Port Takola Yacht Marina and Boatyard in Krabi, Thailand was unveiled last May — The ambitious plan transformed the 110-acre site and saw the creation of 48 berths that can accommodate yachts up to 40 metres. The site has been developed by retired Surgeon Admiral of the Royal Thai Navy Dr Suriya na Nagara and Matthew na Nagara and it offers residences, a resort hotel, nature trails, and a museum. The marina is a 40-minute drive from Krabi International Airport and close to one of the best James Bond locations to visit on a superyacht Phang Nga Bay. “After careful study, we decided to develop a marina to take advantage of the many positive factors of the site, including its perfect shelter and excellent geographical location,” said Admiral Suriya. Matthew na Nagara added that the plan was to create to a “boutique marina that sits comfortably with the surrounding landscape”. “We want to combine the legendary Thai hospitality with the management standards expected by sophisticated international yachtsmen,” he said. The development came at a period when Thailand’s prime minister announced that he wanted to make the country a superyacht hub. Early last year, Thailand granted its first foreign-flagged superyacht charter license which should encourage more yachts to visit the region in the future. Port Takola Yacht Marina and Boatyard in Krabi, Thailand was unveiled last May — The ambitious plan transformed the 110-acre site and saw the creation of 48 berths that can accommodate yachts up to 40 metres. The site has been developed by retired Surgeon Admiral of the Royal Thai Navy Dr Suriya na Nagara and Matthew na Nagara and it offers residences, a resort hotel, nature trails, and a museum. The marina is a 40-minute drive from Krabi International Airport and close to one of the best James Bond locations to visit on a superyacht Phang Nga Bay. “After careful study, we decided to develop a marina to take advantage of the many positive factors of the site, including its perfect shelter and excellent geographical location,” said Admiral Suriya. Matthew na Nagara added that the plan was to create to a “boutique marina that sits comfortably with the surrounding landscape”. “We want to combine the legendary Thai hospitality with the management standards expected by sophisticated international yachtsmen,” he said. The development came at a period when Thailand’s prime minister announced that he wanted to make the country a superyacht hub. 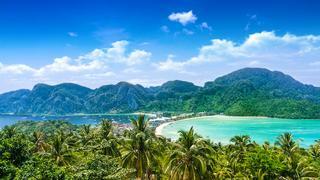 Early last year, Thailand granted its first foreign-flagged superyacht charter license which should encourage more yachts to visit the region in the future. A new marina opened alongside a luxury five-star hotel in Greece last May. The new marina at Miraggio Thermal Spa Resort, located on the east coast of Kassandra, Halkidiki, can accommodate superyachts up to 40 metres. When developing the marina the main consideration behind construction was reducing environmental impact. Designers also focused on boosting water circulation to minimise bacteria development to help prevent damage to yachts’ hulls. Academics from Aristotle University conducted a study on wind and currents in the area which shaped the design. The marina has two “bridge type” jetties which are self circulating and self cleaning. They also help to minimise the swell and swing of yachts berthed in the marina. “Marina Miraggio is one of the best technologically advanced sea developments in Greece because of its overall architecture, positioning and modern engineering methods used for the design and construction of it, even at the primary stages of the design,” said a spokesman for the marina. As well as its clever design the marina also offers 24-hour security, state-of-the-art electricity and water service pedestals, a pump out station, Wi-Fi and a petrol and diesel gas station. There is also a new restaurant and café on site. 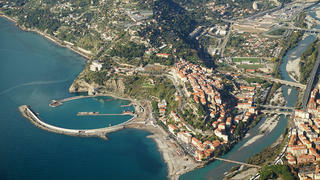 The marina is located at the heart of the Miraggio Thermal Spa Resort, which stretches over more than 330 acres. The hotel's thermal spa is set to become one of the best luxury spas in the Mediterranean, while its helipad will make it an easy stop off for superyacht owners. 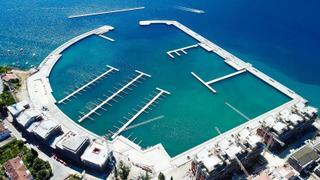 A new marina opened alongside a luxury five-star hotel in Greece last May. The new marina at Miraggio Thermal Spa Resort, located on the east coast of Kassandra, Halkidiki, can accommodate superyachts up to 40 metres. When developing the marina the main consideration behind construction was reducing environmental impact. Designers also focused on boosting water circulation to minimise bacteria development to help prevent damage to yachts’ hulls. Academics from Aristotle University conducted a study on wind and currents in the area which shaped the design. The marina has two “bridge type” jetties which are self circulating and self cleaning. They also help to minimise the swell and swing of yachts berthed in the marina. “Marina Miraggio is one of the best technologically advanced sea developments in Greece because of its overall architecture, positioning and modern engineering methods used for the design and construction of it, even at the primary stages of the design,” said a spokesman for the marina. As well as its clever design the marina also offers 24-hour security, state-of-the-art electricity and water service pedestals, a pump out station, Wi-Fi and a petrol and diesel gas station. There is also a new restaurant and café on site. The marina is located at the heart of the Miraggio Thermal Spa Resort, which stretches over more than 330 acres. The hotel's thermal spa is set to become one of the best luxury spas in the Mediterranean, while its helipad will make it an easy stop off for superyacht owners.